Grab the girl and run like mad, but watch out for chimneys. Playing Blood Roofs is like eating a greasy hamburger with ketchup, mustard and relish squirting all over the place with each bite. It's sloppy as hell, but when all is said and done, you leave satisfied and perhaps hungry for more. 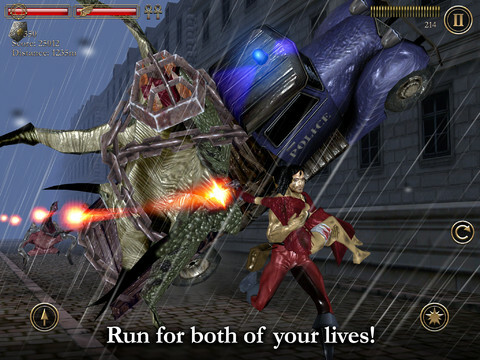 What we have is an endless runner like so many that have come before it, except the developers at Gamesmold took the concept and, pardon the pun, ran with it, with attractive graphics, monsters, weapons and different characters. Blood Roofs has that and more, making it one of the more welcome surprises on iPhone and iPad, so long as you're OK with the game making a mess of itself. That said, this title takes place in a mysterious city covered in fog, so that only the rooftops and select paths are visible. 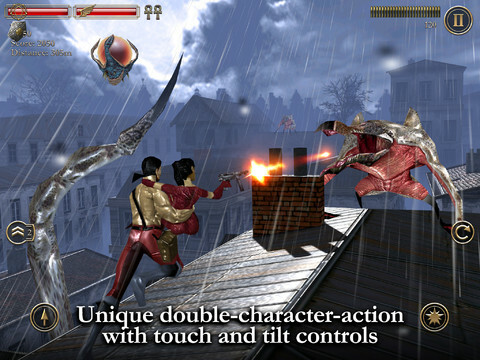 An injured and armed woman named Catherine sits alone, using her machine gun to kill monsters. Then, out of nowhere comes Jake, a dashing and shredded guy that picks her up and takes off, hoping to reach a safe haven by any means necessary. This is where you come in. Tilt the iOS device to instruct Jake to move, tap the left side of the screen to jump, and the right side for Catherine to shoot. That's basically the gist of it, but don't expect a cakewalk. Blood Roofs is surprisingly difficult, since you must jump from rooftop to rooftop to remain on the move, while doing your best to avoid enemies and objects (think chimneys) that'll impede your progress; stop for too long, and the monster giving chase kills them both. Meanwhile, coins collected on this dangerous trek prove useful for unlocking power-ups and even different heroines. First question, is the game fun? Absolutely. We hate to show how old we are, but Blood Roofs has this cool Nightmare Creatures meets Castlevania vibe, thanks in large part to the music and Unreal Engine-powered visuals the studio used to bring this dark and nasty place to life. What's more, you're free to jump to different rooftops, which helps give the feeling (perhaps illusion) of choosing your own destiny, despite the fact that every path leads to the same place anyway. Problem is, the game doesn't play fair. Slight performance issues lead to bothersome stuttering during the more intense moments, while Jake's slow-motion jumping makes it difficult judging where to land, made worse by the annoying camera that will often display the action at weird angles or zoom in too close to Jake, who then blocks the scenery. Not good, when dying means having to restart from the beginning. Finally, there's the matter of price. $2.99 isn't a lot, but it does make Blood Roofs one of the more expensive runners on the App Store. These complaints notwithstanding, it's tough to dislike Blood Roofs, simply because its creators a.) set off to release something more ambitious than the competition, and b.) it's still an enjoyable video game. With this mind, don't be afraid to give it a taste. What's Hot: Combines the joy of running with monster blasting, one big sprawling city covered in fog, two additional heroines to unlock, various items to purchase at the virtual shop, never a dull moment. What's Not: Crackpot camera, floaty jump controls, you can't aim Catherine's weapon.